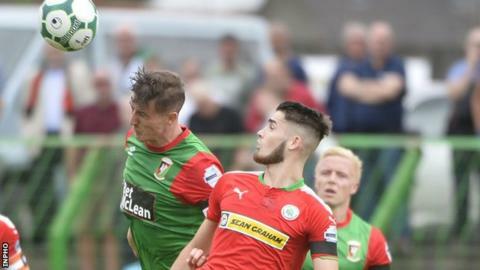 Glentoran go into Saturday's rearranged Premiership game against Cliftonville at Solitude with the future of manager Gary Smyth very much in the balance. Doubt was cast over Smyth's position and future at the East Belfast club on Thursday when a spokesman indicated they were "reviewing all options". Smyth does not yet have the coaching badges required to take charge of the club in European competitions. The match is the last for both clubs before the league splits into two. Cliftonville lie fifth in the table and will be in the top half, while seventh-placed Glentoran are seventh but still chasing a spot in the end-of-season Europa League play-offs. Smyth, 49, who is working towards his A licence, was promoted to become manager of the Glens in January following the resignation of Ronnie McFall. Glentoran have until Sunday to apply for a licence to play in Europe next season. Saturday's match is the first of four consecutive home league games for Cliftonville, who have won four of their six top-flight encounters since Paddy McLaughlin replaced Barry Gray as manager. In contrast, Glentoran are beginning a run of four successive away fixtures. Smyth must plan without James McCarthy, who is suspended after being sent-off in the win over Ballymena two weeks ago, while injury rules out Calum Birney and Conor Pepper.